This time is indeed a blessing one for the Mustapha family; for it is a glory to have two brethren struggling for a political post in their various party, indeed God has shower his mercy to the dynasty of the great Wali of Ilorin. In Kwara of today, the duo of Hon Moshood Mustapha and Alhaji Lukman Mustapha are not only known as the scions of Alhaji Usman Mustapha but also as among the top aspirants jostling for the Gubernatorial seat of the State in 2019 election, albeit, from different party. With that, one would believed by now they should both be working assiduously on how to be the flag bearer of their respective party. Alas! the upsurge in the various opinions by friends and allies of the two aspirants seems uncommon and scaring. Abinito, Why the fuss? What's the shrouded issues therein about the duo aspiration that seems to be in secrecy? Are they in the same party? Do they share the same ideologies and agendas? These and many more questions birthed my succinct treatise - a wake up call, for it's pertinent for the two brethren to know that opportunity comes but once. I have observed keenly and I've made my research objectively on the matter that seems to be exacerbating, my prayer that it will be imminently curbed. While Alhaji Lukman Mustapha is known to be unfavourably disposed to the present hegemony at the helms of affair in the state, Hon Moshood Mustapha is a serial beneficiary and presently one of the elites in the ruling dynasty. In fact, he only resigned recently as the SSA to Senate President Bukola Saraki, with excuse of the need for time to pursue his ambition. It would also be recalled that the Coordinator of Mashood Mustapha campaign team, Alh. 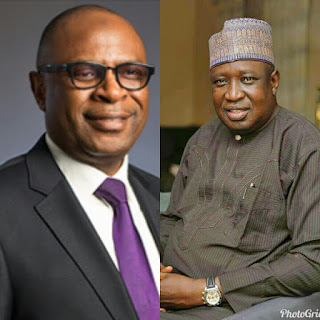 Raheem Adedoyin who they both served as Commissioners under Governor Bukola Saraki, in a birthday message affirmed the rossy relationship between Hon. Mashood Mustapha and Senate President Bukola Saraki, noting that no one knows the latter better than the former and vice versa. It would be realized from the above narratives, even confirmed by Hon. Mashood's close associate, there is no rift whatsoever between Saraki and MM, while Lukman Mustapha remained in the PDP and never showed any perceived feeling of threat to his ambition with his elder brother, Hon. MM in the race. As both have the aspiration to lead the State, they'll only be remembered after the 2019 election for their interest in the race if it is for the common Kwarans or not as Kwarans know what each of them stood for and what they represent in the 2019 general elections. Paradoxically, I got abashed about the body movements of Hon Moshood Mustapha against his brother, Alh Lukman Mustapha. At a point, I asked myself if the former is really into the race for the interest of common Kwarans or just to stop the later from contesting. Why should the former think of subjecting the later to step down his ambition? Why shouldn't he cautioned his media aides not to involve their family into politics? If at the detriment of forcing his brother to step down, they both lost the seat, will it be a plus to the family or otherwise? Is Alh Lukman also forcing MM to step down? Why did MM believes his brother deserve to stepped down? If Alh Lukman Mustapha stepped down for MM, will that be an automatic win for MM? Can't Hon MM just reason beyond politics and play his part well for his success in his party? I pray for him to see and embrace reality above condescension. As an observer and a Common Kwaran, there's no gainsaying that Alh Lukman Mustapha is bullish whilst phlegmatic in the way he has eluded the issue so far. While the official media aide of Hon. MM tried making the public believe there was crisis in the Mustapha family, Lukman Mustapha was out to relay the fact that the family have always been one and his ambition wasn't about him. The public is following with keen interest and the records are saving, for history will never forget our roles in the unfolding events. It is my hope that Hon Moshood Mustapha will be just and fair in his dealings, respect his brother's right, just like he cherished his and pursue his ambition independent of his brother''s. As a senior actor in the Saraki dynasty and the Kwara APC, he should canvass for support within his party without resulting to sabotaging his brother's aspiration. Hon. MM and Alh. Lukman should appreciate the fact that power belongs to God, only Him giveth and taketh, each of you should therefore leave your family out of this, you're not running for a traditional title which is limited to the family. Kwarans will make the decision of whom they believe would serve them better, after your parties made theirs. It is thus more beneficial to let this stakeholders know what you have to offer and not muscle anyone to forgo his ambition. The duo of you in the race is a welcome idea, let no one scout for other to step down, It is an individual civil rights. May God bless our respective family and prayers. Abubakar Ibn AbdulFatah writes from Gambari in the ancient city of Ilorin.